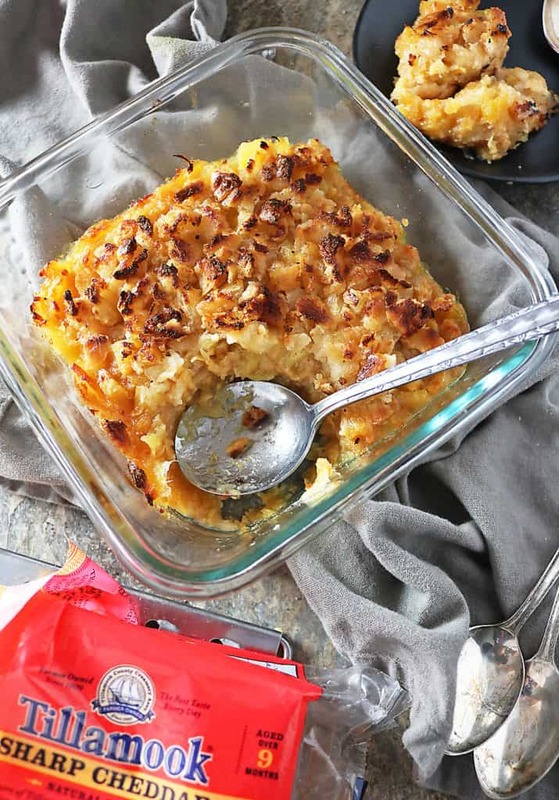 I’ve partnered with Tillamook to bring y’all this Savory Sweet Pineapple Casserole! Thank you so much for supporting the brands that keep this Blog Spinning! 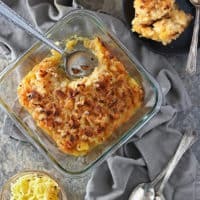 The unique combination of canned crushed pineapple, cheddar cheese, sugar and buttery crackers in this Pineapple Casserole may be befuddling, but the result is so incredibly tasty! The ideal fix of sweet and salty, creamy and crunchy, I am willing to bet that your first bite won’t be your last. The first time I was introduced to pineapple casserole, I wasn’t sure what to make of it. Today I’m going to take y’all way, way, way back to the time when I was married. It was my first thanksgiving at my then sister-in-law’s house and my then mother-in-law had brought in a pineapple casserole. She set it down with the other side dishes, leaving me totally befuddled. Was I to move it to the dessert table? It had pineapples in it after all…which would make it a dessert – right? 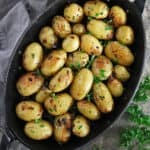 When my then MIL told me that it was a southern side dish with pineapple chunks, cheese, sugar, flour, butter, buttery crackers and pineapple in it, I was even more befuddled! Even though I had been in Atlanta for a while, this was my first run in with this unique concoction. And, it had me racking my brain to imagine all these flavors intermingling. And, it was like nothing I had ever tasted. It was sweet but at the same time savory. It was creamy and crunchy. It was comforting and invigorating. And, it was tasty. So tasty. One taste just wasn’t enough. I had to go back for seconds. And, thankfully, someone finished it off before I could get thirds! That year, on Christmas Eve, my then in-laws had my parents over for lunch and my mom fell more in love with that pineapple casserole, than I was. Ever since that Christmas Eve, my mother has requested that pineapple casserole at every holiday meal I‘ve been in charge of preparing. Over the years, I have doctored up the recipe my then mother-in-law gave me. Instead of butter, I use coconut oil. And, instead of plain, buttery crackers, I use whole-wheat buttery crackers. I sub in coconut sugar for regular white sugar, gluten free flour for regular flour and, mild cheddar for Tillamook’s Sharp Cheddar. 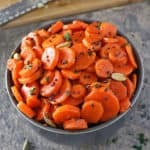 I also like to broil this casserole at the end of baking it, to make the topping extra crispy. Speaking of Tillamook Sharp Cheddar, I am so excited that Tillamook products will now be available in grocery stores here in Georgia! Last summer, my daughter and I got to enjoy a variety of Tillamook cheddar cheese and ice cream when we visited Portland. And, I thought I’d be waiting a year to get my Tillamook fix. But, in this instance, I am overjoyed to be wrong! Tillamook is a farmer-owned co-op, made up of several local creameries dedicated to producing high quality products. 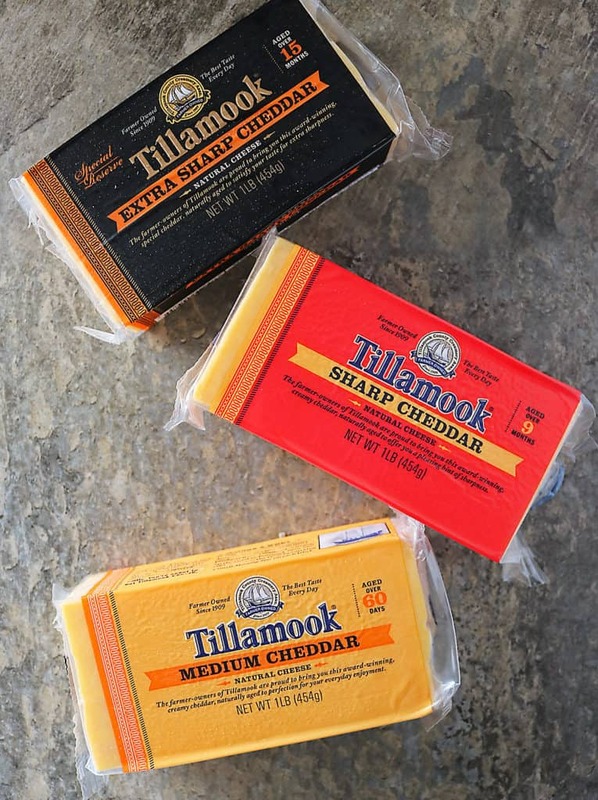 Which makes it no surprise that Tillamook has a growing list of 700+ awards for its products, including The World’s Best Medium Cheddar Cheese award in the 2010 World Championship Cheese Contest! 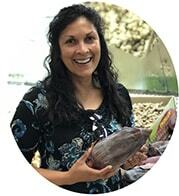 If you find yourself in Oregon this summer, please make it a point to stop by Tillamook’s newly remodeled visitor center – you might run into me there – as well as some delicious cheese! 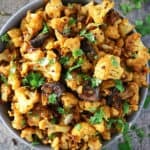 I am hoping you whip up this Pineapple Casserole and serve it as a unique side dish to accompany your summer Burgers. 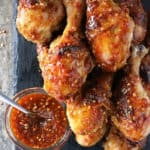 My daughter loves to top this with some of spicy roasted pepper sauce. Or, you could serve it chilled as a dessert with a side of whipped cream or coconut cream. Either way, one bite of this will leave you wishing for more! Stir the coconut sugar and GF flour together. Then, add in the cheddar a little at a time and stir so cheddar is well covered with the flour/coconut sugar mix. 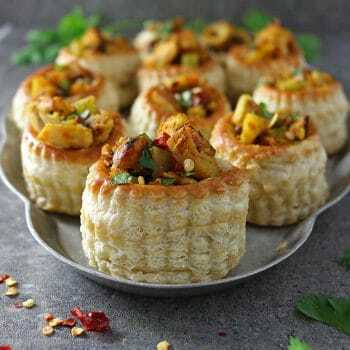 Then fold in the pineapple and mix till all ingredients are well incorporated. 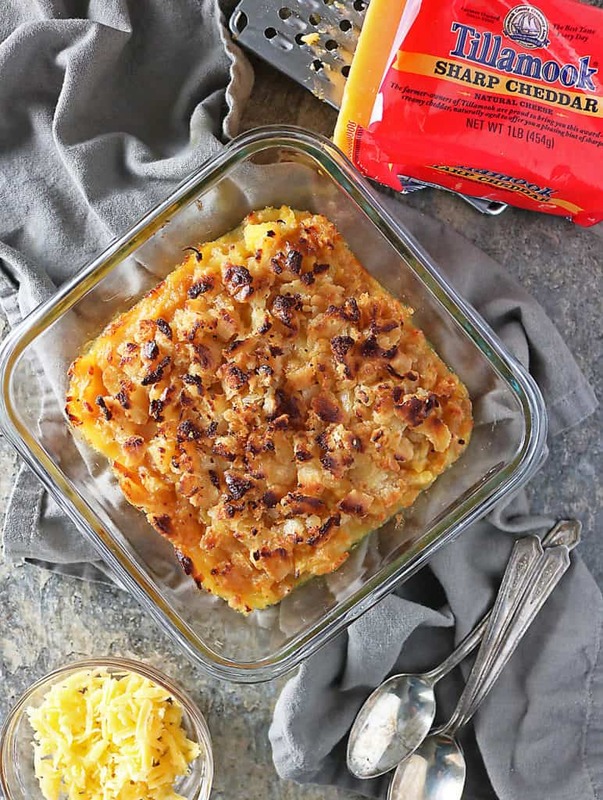 Grease an oven-safe casserole dish and spoon the pineapple/cheddar mix into it. 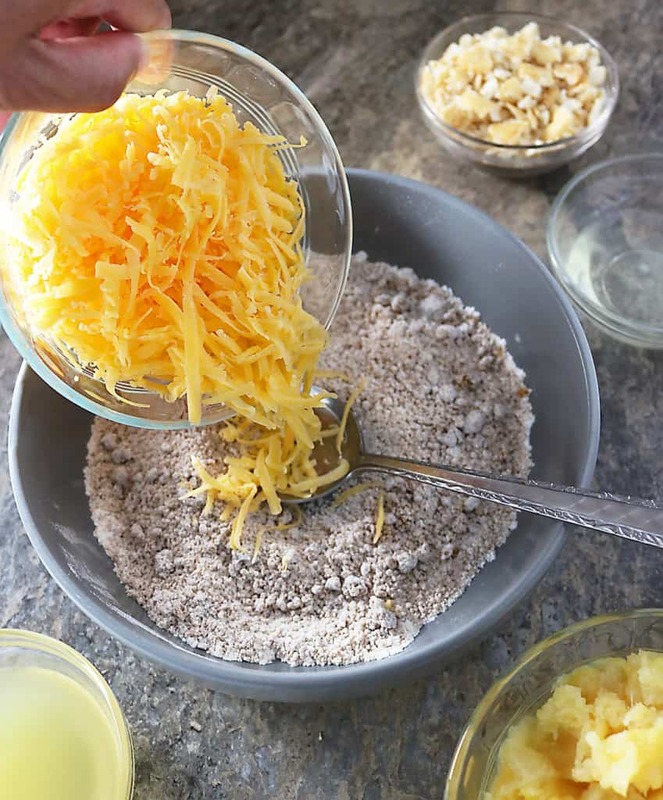 Then, make the topping by mixing the buttery crackers with the reserved pineapple juice (from the canned crushed pineapples) and the coconut oil in the same bowl. Add the topping onto the pineapple/cheddar mix and bake for 25 minutes. Then, turn oven to broil and broil casserole for about a minute or till topping is golden brown. 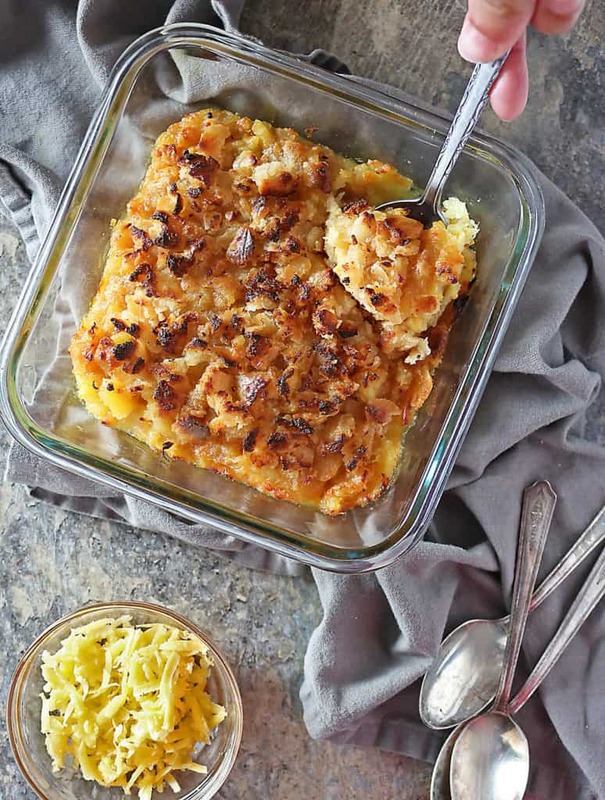 Serve warm or cold – this pineapple casserole is delicious either way! Oh, I know all about pineapple casseroles…but like you, it’s been years since I was first introduced. (And honestly years since I’ve had one as they used to make an appearance at my grandparent’s house in upstate SC way back when.) Your story about what to make of this recipe had me laughing, and it reminded me of the time when we visited my aunt/uncle in Texas and they served jello salad. Laura saved it for dessert, but only to have my aunt ask “Do you not like jello salad?” It was the salad course, after all! 🙂 Either way, thanks for reminding me of this classic! 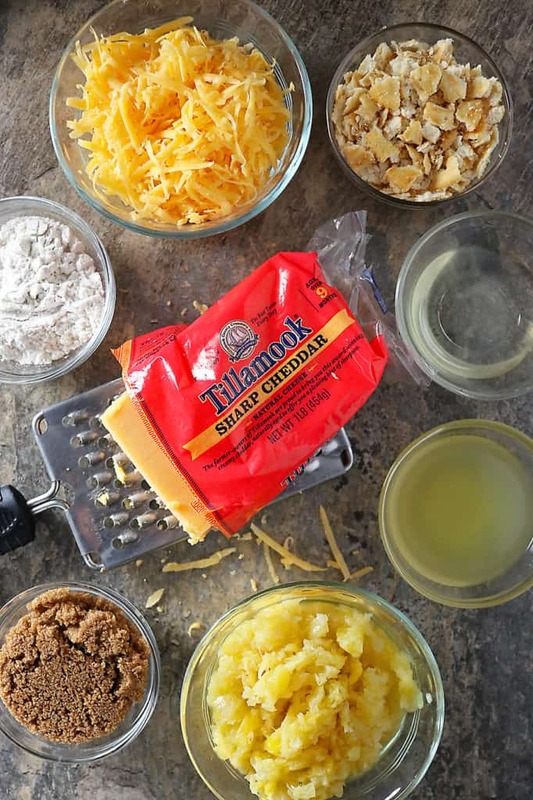 And I’ll have to keep an eye out for Tillamook…I’m a sucker for a good, sharp cheddar cheese!! I think this sounds great! I don’t think I have ever had a pineapple casserole before, but that needs to change soon! I have never had pineapple casserole. This is a meal after my own heart as I do like pineapples. I cant believe I haven’t tried this yet. 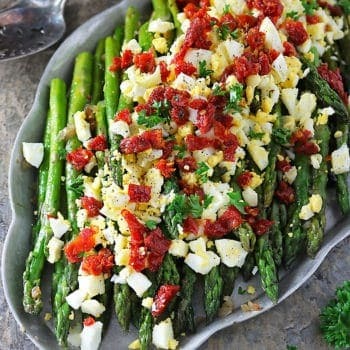 Definitely will have to add this dish to my must try – especially for summer. We used to eat this all the time especially on Easter with our ham! Love the way you’ve made it more modern. Love that cheesy goodness. What a unique recipe. I can’t wait to try it! I have only ever had cheddar and pineapple together on a pizza, but this sounds delicious and really comforting too. My mother-in-law used to make something similar and it was SO good! I’d forgotten about it, especially since my husband does not like pineapple. But I’m going to think of a reason to make this again!! It’s fabulous! I’ve never had pineapple Casserole but boy am I curious! I love everything in there, so it stands to reason I will love it as much as you do! Looks fabulous, my friend! Befuddled. Now that’s a great word isn’t it? 😀 But I’m certainly not befuddled about being up for trying this Shashi! It looks (and sounds) absolutely delicious. Bet that cheese makes a real difference too. I’m a sucker for a good sharp cheddar. Yum! Wow, this is a completely new idea for me, I have never heard of a savory pineapple casserole. It sounds great! 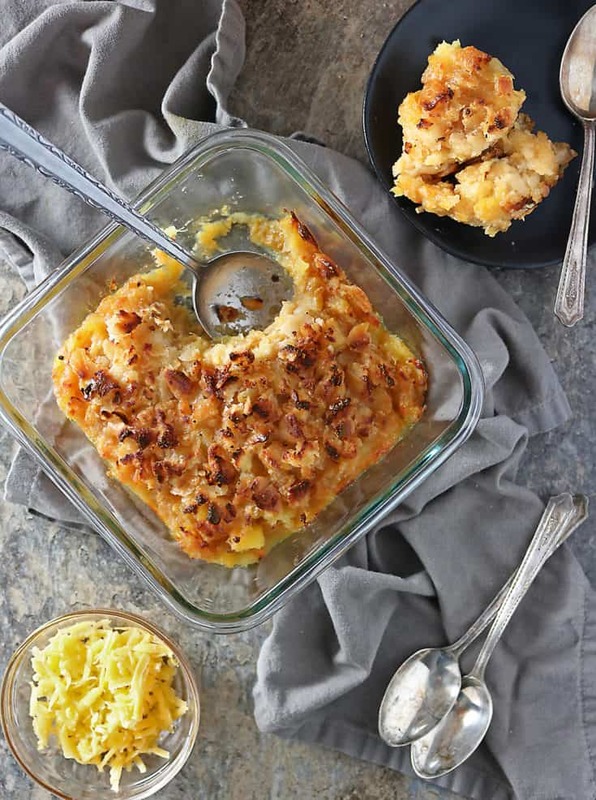 Pineapple casserole is a new one for me, but I’ll try anything twice.